Delhi Police Lost Report Mobile App Huge Success! Earlier this year, Delhi Police had launched a mobile application which could be used to register complaints for lost articles. Termed as ‘information reports’, these complaints are essentially lodged to get a replacement such as lost SIM card, any official document like high school mark sheet etc. Earlier, the complainant was required to visit the nearest police station to lodge such reports, but not any longer. 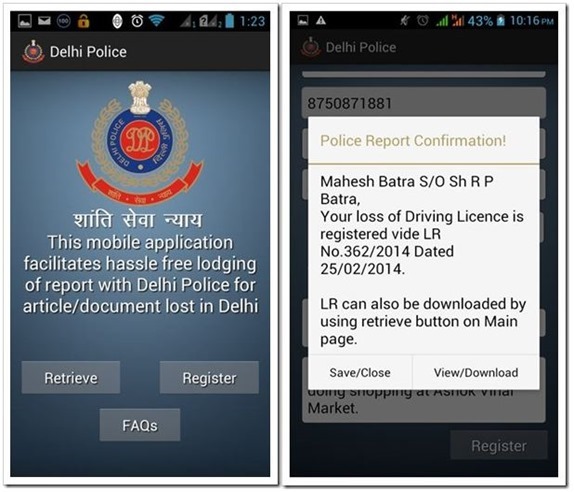 Using this mobile app called “Delhi Police Lost Report”, Delhi residents can now lodge their reports to lost articles on the go and receive a copy of their report on the email. Termed as one of it’s kind in India, this Android application gained quick popularity on Google Playstore as it was downloaded by 10,000 – 50,000 people, and reviewed by more than 1243 users, average rating being 4.4. Delhi Police has now come with data regarding it’s usage, and the numbers are encouraging. As per a statement released by them, since February 28, 2014 when it was officially launched, more than 5.5 lakh complaints have been registered on this platform. Besides these, several Police Clearance Certificate (PCC) were also issued using this mobile app. As per the statement, 7813 such PCCs were issued after 9178 applications were received using the app. Buoyed by the response generated by the mobile app, Delhi Police is now considering starting accepting reports of vehicle loss and FIR among other online services. Delhi Police has embraced technology in a major way. In August this year, they launched a dedicated help line powered by WhatsApp: 9910641064, using which any alert citizen can pass on information about any crime or report any issue using images, videos or text. Issues related with corruption, illegal parking, unauthorized encroachment, misbehavior by police personals or any illegal activity can be reported using this helpline. As of September, 2014, more than 23,000 messages and complaints were received on this number. Besides using WhatsApp on this line, citizens can also email the report at [email protected] or use other helplines: 1064 and 1800111064.